In today’s article we are going to discuss about the Requirement Traceability Matrix(RTM). When you see or first time you hear about RTM (requirement Traceability Matrix) you might not have any idea about it, but it is simple term/process which is used in Software Development and Software Testing. You will understand this after reading this article and you will also understand how you can use it in efficient way in your software project. It’s an Matrix which is nothing but a table which shows the relations between requirements(software requirements, Business Requirements) , test scenarios, test cases etc. in other word it’s an table which shows many to many relationship. In a project we have lots of requirements and to evaluate those requirements we testers need to write the test cases for those requirements so that we can surely say that the requirements in software are implemented in correct way. 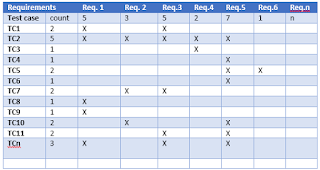 So this table Requirement Traceability Matrix shows us the relationship between the Requirement and Test Cases. For example. Let’s say there is requirement of the login and we have wrote test cases for the login, then this table will show us the requirement which is in this case is login and its relationship with test cases which we have wrote to evaluate the login requirement. It shows that for which requirement, which test cases are written. This help us to evaluate that all the requirement has test cases. And there is no requirement which can be deliver without tested. There are forward traceability, backward traceability and bidirectional traceability. Forward traceability means that the mapping in the table takes place from the Business requirements to the end development product. And backward traceability means when mapping takes place from the product to the Business requirement. And bidirectional traceability means when there is mapping from Business requirement to product and product to Business requirement then it is call ac Bidirectional Traceability. There is no fixed template for RTM. It’s totally depends on the company requirements and needs. Some may map business requirements, software requirement and test cases some company likely to map whole requirements, software design and test cases etc. few examples I have given below. This is a basic template for requirement traceability matrix (RTM). Here you can see in the first table there are Business Requirement ids are mentioned and in second Colum, software requirements ids are mention and in third Colum there are respective test cases ids. Usually there can be multiple requirements for single business requirements and same with the software requirements, there can be multiple test cases for a single requirements. Like for BR1 there can be software requirement SR1, SR2 SR3 etc. and for SR1 there can be TC1, TC2 and TC3. This is another template for requirement traceability matrix’s, here only software requirements and test cases are mapped. You can see that at first left corner Colum, here test case id is mentioned and in first row, requirement ids are mentioned. So here, that cross sign below the requirements and in front of test case id, indicates that the test case is for testing the particular requirements. 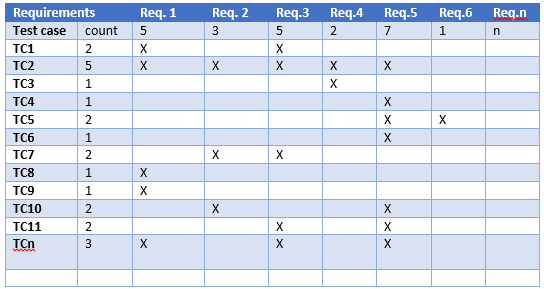 You can also see multiple cross below the requirements, that is because one single requirement can requirement multiple test case to get fully tested.in Requirement Colum, below you can see the count, e.g there is 5 count below the req.1 means that for Req.1 there are 5 test cases to test it. Similarly with all. There are lots of template for RTM but the concept remain the same. Mapping everything on paper.